How long can I leave components in a breadboard? In school, I was told not to leave components in a breadboard for extended periods of time. However, this length of time was never quantified. The reasoning was that the contacts would eventually lose their "springiness"; at some point later in time, you'd be debugging issues with a circuit, only to find out that the contacts were bad. I have no idea if this is really true, or if breadboards are now made so well that it's not an issue. I have some nice ones, but in the end they seem to use the same narrow white piece that everyone else uses. The outer rows of the Sharpie'd area make intermittent contact, so we avoid the whole section. Notice that some of the numbers are rubbed off, and also notice the burnt spot at the top of the picture where something burned up. 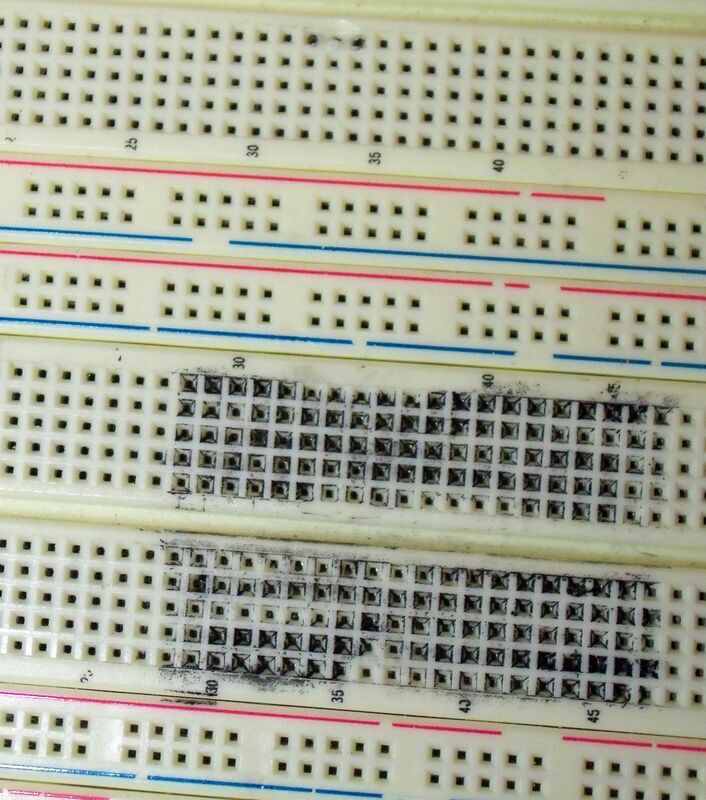 The breadboard still has two other middle sections, and this section is only 20 rows tall, so that leaves 172 good rows. On a university budget, that doesn't merit replacing the board. If you are demonstrating breadboarded circuits to a client, you should probably replace the whole thing. By the way, this board is at least 8 years old, and still works fine except for the indicated area. I've only been around it for three years, but no one has had any problems with it that I've heard of. I've never had any problems, and I've left components in the board for months. Component leads seem to be quite a tight fit anyway, so whether it's springy or not I think it will make contact anyway. Addressing the matter of "losing springiness", or more technically setting the springs by exceeding their yield strength, all that really matters is how much stress (pressure) you subject them to, which will depend on the strain (displacement). Over a very long time, they may take a set, but it would take years or extremely elevated temperatures. Basically, avoid inserting extremely large component leads (diodes are the most common offender when breadboarding I think) into the holes. That's your enemy, not time. I'm mostly using common sense here, but let's see what would happen to a board when it's left with components in. Oxidation would occur even with no components. Probably some parts of the springs would oxidate differently without components than if components are in, but contact surfaces would probably be more exposed without components in, so I don't think that having components in would make more bigger impact then just having board sit in same conditions without any components. Next, let's take a look at problems which could come from components themselves. Most components don't produce any debris by just lying around, so only problem could be bad electrolytic capacitors which could leak and contaminate the board. Maybe broken LCD could contaminate board too? I can't think of any other components which leak at the time. If we take a look at the contacts themselves, cold welding could cause problems if the components need to be removed and board repurposed for another use. I don't think that cold welding would cause problems with signal quality on the parts which were left there and allowed to weld, because that's what we use for standard network cables and it works. If the components are removed, contact surface of the springs could be damaged or contaminated by remains of the weld. How big problems this is would depend on materials used for springs and component leads. I really don't know what happens to springs which are left in a certain non-relaxed position for extended periods of time, but there could be problems with that. But then again, I think that springs would wear out more by inserting and removing components. In the end, I don't think there would be any reason for anything bad to happen if prototypes do remain assembled on a breadboard. Since the myth comes from a school, maybe the biggest issue would be simple mechanical damage and problematic storage of breadboards. As far as I see it, components are exposed on top of a breadboard and can be damaged very easily. Also, it would be difficult to stack populated breadboards. On the other hand, I don't see anything breadboard specific here. Same rules would apply to any other type of prototyping board. I would only worry about the "spring" if you are using over size leads. You could see a issue with oxidation. Usually removing and reinserting the wire or component will "wipe" the oxidation on the contacts. As I understand it, springs only wear out when they move. Leaving them loaded, or leaving them unloaded should be fine. What you'd want to avoid is unnecessarily unloading and reloading them. In a past life I breadboarded a 555 timer circuit together. The circuit did splice detection on a Asphalt roofing line. The area was subjected to high humidity. The circuit ran flawlessly for 10 years until they shut the plant down - otherwise it may still be running today. I have friends who have permanently-constructed projects using breadboards. In this case, it was a audio crossover, and it had been assembed on a solderless breadboard, the wires were given some additional retension by being glopped down with hot-glue, and the whole thing was stuck in an enclosure, and then used for years without issue. Not the answer you're looking for? Browse other questions tagged prototyping breadboard or ask your own question. How to use 200 mil DIP components on solderless breadboard? Can pins (breadboard friendly) be added to non-drilled pads? Why are components hard to insert into a breadboard? How to use a breadboard?